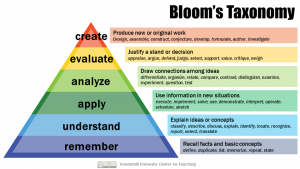 Bloom’s Taxonomy was created in 1956 by educational psychologist Dr. Benjamin Bloom. This method was created in order to promote higher forms of thinking in education. Such forms include: analyzing and evaluating concepts, processes, procedures, and principles, rather than just remembering facts. How Can Bloom’s Help Me?